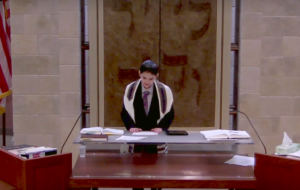 Temple Rodeph Torah offers a truly unique experience for our Bar and Bat Mitzvah students. Working with our dedicated Bnai Mitzvah Guide, students explore how their personal interests relate to their Judaism, and how they can share those interests with the congregation. In addition to the thorough Hebrew tutoring offered for students, the Guide works with each individual student to enhance understanding of the student’s Torah portion, and facilitate connections between the parsha (Torah portion) and the young learner’s hobbies, passions and strengths. The result is a deeply personal experience for the Bnai Mitzvah, their families, guests and the entire congregation! Sound intriguing? Please see some of the amazing presentations from our past Bar and Bat Mitzvah students.